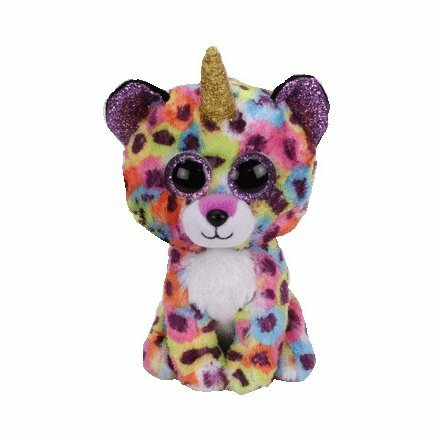 Giselle is a multicoloured unicorn leopard covered in purple spots. She has large, glittery purple button eyes and a black button nose. On top of her head is a sparkly gold horn and the inside of her ears are sparkly purple. Giselle was released in January 2019. Giselle is one of the range of Beanie Boos that grew a horn but were not a unicorn. The first of this series were Ramsey the unicorn lion, Heather the unicorn cat and Enchanted the unicorn owl.